Researchers have found 10 g daily of glycine is tremendously effective in stopping inflammation. Glycine is regarded as a non-essential amino acid as it can be produced in the liver. This has led to it being largely overlooked as a valuable nutritional supplement. In reality the liver's ability to produce optimum amounts of glycine is often limited. This can be due to the liver operating below par, a very common state for those in less than optimum health; so restricting glycine production. The other main reason for relatively low glycine status is consuming concentrated proteins such as eggs, meat, fish, milk and cheese. Methionine, the amino acid found in protein foods, needs glycine to detoxify it's end products. Glycine is found in the skin and collagenous rich parts of animals and bone. It is almost totally absent in muscle meats. One of the main healing nutrients in Ocean Repair is glycine. Glycine has many healing properties as detailed in the full article here. The ideal dose of glycine is in the region of 10g daily for most people. Since Ocean Repair is only about 30% glycine it would require 30g of Ocean Repair daily to achieve that level of glycine, so each pot would only last a few days. There are other valuable nutrients in Ocean Repair as detailed in the product info here. Hence, we recommend the combination, where Ocean Repair provides these nutrients and Revive & Build boosts the glycine to the proper daily level and further provides a good daily dose of vitamin C (1g). As well as being more effective in combination these remedies used together provide a more cost effective option than Ocean Repair alone. You will see (if you look) that this combination is recommend as support for so many other supplements and health protocols throughout our website. There are several reasons for this. The prime one being the usefulness in tackling inflammation. For example; protein from meat is mostly derived from muscle. This being a prime source of inflammation, ageing and a host of related diseases because of the damaging effects of one of the amino acids found in muscle meats (amongst other sources such as cooked eggs). This amino acid is called methionine. Glycine at sufficient levels effectively deals with the toxic by-products of methionine to drastically reduce inflammation and related auto-immune responses. Furthermore, glycine is a major nutrient in the production of the main anti-oxidant in the body; glutathione. Ocean Repair works in tandem with glycine to support collagen repair and production. This is not just important in combatting the effects of ageing and arthritis, it is also important in maintaining the lining of the gut. This provides major protection agains the inflammatory bowel diseases. Furthermore, with regards to cancer; metastasis only occurs when collagen is weak. There are specific cancer protocols that work by boosting anti-oxidants and strengthening collagen with the amino acids found in this combination. Another example would be proline. It is becoming widely recognised that most chronic diseases have a degree of inflammation and auto-immune responses at their core. So by protecting against collagen destruction many can be reversed. Even using these 2 supplements alone can have dramatic and cost effective healing effects on the body. Adding a Selenium supplement such as detailed here further promotes the formation of the bodies main anti-oxidant; Glutathione. Aid to good rest and sleep. Glycine is regarded as a non-essential amino acid as it can be produced in the liver. This has led to it being largely overlooked as a valuable nutritional supplement. In reality the liver's ability to produce optimum amounts of glycine is often limited. This can be due to the liver operating below par, a very common state for those in less than optimum health. so restricting glycine production. The other main reason for low glycine status is consuming concentrated proteins such as eggs and meat. Methionine, the amino acid found in protein foods, needs glycine to detoxify it's end products. Glycine is found in the skin and collagenous rich parts of animals and bone. It is almost totally absent in muscle meats. It is interesting to note that longevity studies that indicate calorie restriction can extend life have found the same thing for methionine restriction. Glycine (and only glycine) can detoxify excess SAM-e*, which all excess methionine is turned into. Otherwise, harmful excessive methylations can occur, resulting in the formation of such reactive and toxic substances as formaldehyde, which causes oxidative stress by generating reactive oxygen species (ROS) that cause cellular ageing and need to be neutralised by anti-oxidants. *SAM-e - S-Adenosyl methionine is a common cosubstrate involved in methyl group transfers, transsulfuration, and aminopropylation. Although these anabolic reactions occur throughout the body, most SAM-e is produced and consumed in the liver. Although anti-oxidants from fruits and other foods are helpful in combating oxidative stress, the body’s main anti-oxidant molecule is called glutathione. Glutathione is a molecule made up of three amino acid molecules, one of which is glycine. Therefore, when methionine intake is high, the body needs extra glycine for two reasons: to directly detoxify the extra SAM-e, and to combat the higher level of oxidative stress by making more glutathione. The activation of the methionine clearance pathway also activates the pathways for the synthesis of glycine, but the body cannot keep up, because the consumption of glycine is too low! Combining glycine and selenium is a good way to improve glutathione synthesis. Researchers have found 10 g daily of glycine is tremendously effective in stopping inflammation. As glycine aids sleep it may be better to consume in the evening. Glycine dissolves easily in a little juice or water. Glycine is complimentary to hydrolysed collagen as per the article above. 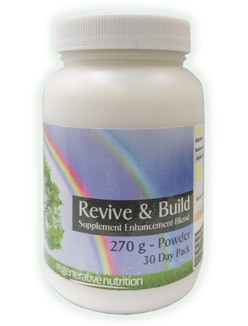 Since hydrolysed collagen contains various nutrients along with 30% Glycine that work together for repair and maintenance of all the numerous collagen structures of the body (along with vitamin C as included in our Revive & Build).Taking hydrolysed collagen alone however (unless consumed in very large doses) does not provide optimum levels of glycine and works out as an expensive option. So taking some hydrolysed collagen, glycine and vitamin C provides broad spectrum anti-inflammatory anti-oxidant (via generation of glutathione) and healing support. Adding Selenium further increases the generation of glutathione. Auto-immune disorders occur when the immune system mistakes its own tissues as foreign and mounts an inappropriate attack on those tissues. Overblown inflammation is a common thread in these chronic conditions. Many chronic health disorders are increasingly being recognised as having an autoimmune component, including diseases traditionally recognised as 'degenerative' such as Alzheimer's and certain circulatory disorders. Autoimmune conditions are connected by one central biochemical process: A runaway immune response; systemic inflammation. A full examination of Auto-immune disorders can be found here and in the links extending from that page. From the perspective of this article, the important point is that the end result in many cases of chronic autoimmune disorders is excessive unremitting inflammation. The fact that this inflammation can be overcome with glycine is a remarkable progress in the understanding and defeat of autoimmune diseases. Supplementation with hydrolysed collagen, Vitamin C and glycine should be undertaken by all of those with with autoimmune disorders. For example; in the cases of arthritis, fairly rapid improvements have been obtained by those using this combination. The first stage of improvement, being quite rapid, is due to elimination of inflammation of the joints. Following on over a period of months will be the repair of the cartilage around the joint. Organic Silicon is a useful adjunct during this stage. As a further example; chronic asthma, where the reduction of inflammation of the bronchial tubes will quickly result in improvements in the condition and over a longer period help to strengthen repair the collagen of the bronchial linings resulting in longer term improvement. This combination of supplements is a useful broad-spectrum, long term, protection against all chronic diseases developing. Dr. Brind discusses diabetes and how to help reverse it by reducing metabolic inflammation attacking the beta cells of the pancreas with glycine as it reverses metabolic inflammation. Studies have found that those with higher insulin resistance have less glycine in their blood. He states that the major reason for cardio-vascular disease is from inflammation mainly due to glycine deficiency. It has been known for many years that regular vitamin C consumption (a co-factor in collagen that has some minor anti-inflammatory effect) protects against cardio- vascular disease, especially of the blood vessels. Since vitamin C works with glycine to form collagen we can see the link here. Reducing inflammation that normally attacks the blood vessels and strengthening the integrity of of the blood vessels by supporting collagen formation. Blood vessels are mainly composed of collagen. Dr. Brind, from years of studying glycine supplementation concludes that most chronic disease is routed in chronic inflammation, due mainly to a nutritional deficiency of glycine. Even that which is regarded as normal inflammation as a part of the healing process is a misconception. Inflammation should only occur when there is infection. An injured person with adequate glycine stores will temporarily experience swelling but not inflammation. A sunburn will rapidly heal. Gelatin and glycine have recently been reported to facilitate the action of insulin in lowering blood sugar and alleviating diabetes. Gelatin has been used successfully to treat diabetes for over 100 years (A. Guerard, Ann Hygiene 36, 5, 1871; H. Brat, Deut. Med. Wochenschrift 28 (No. 2), 21, 1902). Glycine inhibits lipolysis (another anti-excitatory, "antiestrogenic” effect), and this in itself will make insulin more effective, and help to prevent hyperglycemia. Since persistent lipolysis and insulin resistance, along with a generalised inflammatory state, are involved in a great variety of diseases, especially in the degenerative diseases, it's reasonable to consider using glycine/gelatin for almost any chronic problem. A generous supply of glycine/gelatin, against a balanced background of amino acids, has a great variety of anti-stress actions. Glycine is recognised as an "inhibitory” neurotransmitter, and promotes natural sleep. Used as a supplement, it has helped to promote recovery from strokes and seizures, and to improve learning and memory. But in every type of cell, it apparently has the same kind of quieting, protective anti-stress action. The range of injuries produced by an excess of tryptophan and serotonin seems to be prevented or corrected by a generous supply of glycine. Fibrosis, free radical damage, inflammation, cell death from ATP depletion or calcium overload, mitochondrial damage, diabetes, etc., can be prevented or alleviated by glycine. Skin cells and nerve cells and many other cells are "electrically” stabilised by glycine, and this effect is currently being described in terms of a "chloride current.” A variety of mechanisms have been proposed for the protective effects of some of the amino acids, based on their use as energy or for other metabolic purpose, but there is evidence that glycine and alanine act protectively without being metabolised, simply by their physical properties. A small dose of glycine taken shortly after suffering a stroke was found to accelerate recovery, preventing the spreading of injury through its inhibitory and anti-inflammatory actions. Its nerve-stabilising action, increasing the amount of stimulation required to activate nerves, is protective in epilepsy, too. This effect is important in the regulation of sleep, breathing, and heart rhythm. Glycine's anti-spastic activity has been used to alleviate the muscle spasms of multiple sclerosis. It is thought to moderate some of the symptoms of schizophrenia. A recent publication shows that glycine alleviates colitis; but the use of gelatin, (contains 30% Glycine) especially in the form of a concentrated gelatinous beef broth, for colitis, dysentery, ulcers, celiac disease, and other diseases of the digestive system, goes far back in medical history. Pavlov's observation of its effectiveness in stimulating the secretion of digestive juices occurred because the stimulating value of broth was already recognised. Growth hormone is extremely important in maintaining muscle tone and strength, and general body capability as we grow old. The following mentioned studies confirmed that glycine supplementation is effective in causing significant increase in growth hormone. Growth hormone becomes insufficient as we age and in fact is part of the ageing process. In one study, 6.75 grams of glycine before sleep caused a three-fold increase in growth hormone. A second study, conducted by a Japanese research team, showed that 30 grams raised HGH levels ten times over baseline in patients who had gastric surgery. They concluded that the facts demonstrated that glycine is one of the stimulatory agents inducing the pituitary gland to secrete growth hormone. Due to its ability to stimulate this production, glycine is primarily used to support muscle growth and repair and stimulate youthful effects on metabolism, bone growth and immunity. Glycine has a tremendous effect on reducing inflammation as extensively detailed above. This action on its own will aid the body in overcoming various diseases including cancer. Inflammation creates free-radicals and hence cell and tissue damage and stress. Glycine is one of the factors promoting wound healing and tumor inhibition. It has a wide range of anti-tumor actions, including the inhibition of new blood vessel formation (angiogenesis), and it has shown protective activity in liver cancer and melanoma. Glycine along with other collagen building and strengthening nutrients such as gelatin (Ocean Repair) and vitamin C can be used as part of an anti-cancer protocol. Useful in dampening hyperactive brain activity that produces spasms. In one study, just 1 gram of glycine a day for six months to one year significantly reduced spasms in all ten patients with severe chronic spasticity in the legs, including seven of whom had multiple sclerosis. Useful in increasing output in exercise workouts and further enhancing muscle tone. Decreases brain excitability as well as mood and emotional symptoms associated with brain disorders such as hyperactivity, schizophrenia, bipolar disorder and epilepsy*. Supports energy production, memory, blood sugar management and prostate health, as shown in several studies. Can be used as part of anti-ageing regime. Helps with the breakdown of fat by regulating the concentration of bile acids. * One study focusing on treatment-resistant schizophrenic patients found that high-dose glycine in association with antipsychotic medication could significantly alleviate negative symptoms associated with this mental illness. These results are supported by similar studies investigating psychological disorders. Other studies have shown that glycine treatments can help to prevent seizures associated with epilepsy. The range of injuries produced by an excess of tryptophan and serotonin seems to be prevented or corrected by a generous supply of glycine. Fibrosis, free radical damage, inflammation, cell death from ATP depletion or calcium overload, mitochondrial damage, diabetes, etc., can be prevented or alleviated by glycine.